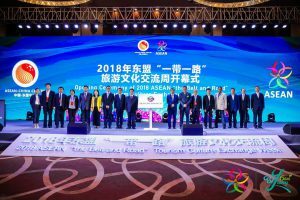 Mr. Masataka Fujita, Secretary General of the ASEAN-Japan Centre (AJC) attended the “2018 ASEAN “the Belt and Road” Tourism Culture Exchange Week” in Guiyang, China co-hosted by the ASEAN-China Centre (ACC) and the Guizhou Provincial People’s Government. 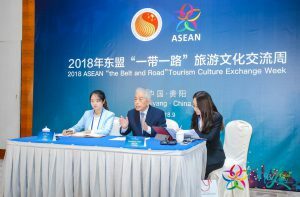 The event aimed to create the brand of tourism association between ASEAN and western China, and to build a new mechanism and better bridge for the exchange and cooperation between ASEAN and Guizhou. It was attended by H.E. Mr. Thong Khon, Minister of Tourism, Kingdom of Cambodia, H.E. Dato’ Zainuddin Bin Yahya, Ambassador of Malaysia in China, and other 300 participants of stakeholders in tourism and culture. 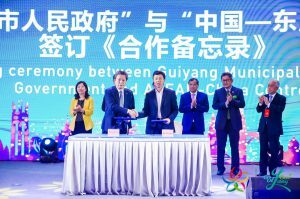 The participants shared the two-way tourism promotion, and witnessed unveiling ceremony of ASEAN-Guizhou Tourism Culture Promotion Center. SG Fujita was interviewed by the local media and shared his thoughts on the possibility of expanding the target segment to female travelers and seniors, from the male business travelers which currently accounts for the major share of the Japanese travelers to China, responding to the question on what we can do to enhance tourism exchanges and cooperation between Guizhou and Japan. SG Fujita also stressed to continue the close cooperation with the ACC within the framework of ASEAN+3 relationship to respond to the future plan to enhance promotion of Guizhou tourism in Japan. There were active exchanges and discussion among the participants from the tourism sectors. SG Fujita discussed the possible cooperation for the tourism promotion in Mekong region with Mr. Jens Thraenhart, the Executive Director of Mekong Tourism Coordinating Office.